Edinburgh Monarchs surrendered their Premier League Fours championship speedway crown in somewhat timid fashion at Peterborough Stadium on Saturday. The Capital quartet of skipper Sam Masters, Ryan Fisher, Kevin Wolbert and Erik Riss were drawn in what was considered the easiest of the semi-finals against Berwick Bandits, Rye House Rockets and Ipswich Witches. 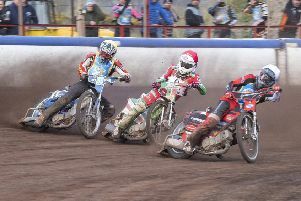 But, Monarchs were surprisingly mugged by Berwick, who finished on top with 21 points – one clear of Monarchs who failed to make the final of the two-day event yesterday which they will regard as a bitter disappointment. Masters was in brilliant form winning all of his three rides for a nine-point maximum and while Fisher managed one win, Wolbert and Riss failed to find the chequered flag and this shortfall proved their undoing, Berwick squeezing through with five race wins to their credit, leaving Monarchs, who won the title in splendid style at Redcar 12 months ago, to hit the road a day earlier than planned. Plymouth were the eventual winners. Meanwhile, Monarchs have rearranged their Knockout Cup quarter-final tie against Glasgow Tigers for Friday, August 26, and travel to Ashfield for the first leg on Sunday.